I wish this were a happy column about the advance of California public transit. I wish I could report that my own life is better now that I ride the brand-new Metro Expo Line extension to work in Santa Monica. And I wish I could validate all the triumphant talk of the great metropolis of Los Angeles becoming a fabulous train town again, with the restoration of a vital rail link between its city center and the Pacific. But I’m a rail commuter in Southern California now, so I no longer have time for fairy tales. Or much of anything else. Perhaps I expected too much. For four long years, I’ve commuted between the San Gabriel Valley and Santa Monica—always at least an hour each way, often 90 minutes or more—while dreaming of the day when the Expo Line would extend to downtown Santa Monica and my commute, and with it my life, would change for the better. That day arrived two weeks ago, and immediately my dreams were dashed. I had been ready for the hiccups and kinks of a new line, and I had been warned that the trains would be slower and crowded until Metro could add enough cars and drivers for full service. But I was unprepared for just how slow—and painful—a commute via light rail could be. On my first day—the fourth day of service on the new line—I dropped off my two younger boys at preschool and drove five minutes to a Gold Line station in Pasadena, parked, and walked three minutes to the train. I was happy and eager for the new routine. Then I waited 20 minutes for a train to arrive—the wait is supposed to be less than 10 minutes at that hour. And the train moved slowly—it took more than 40 minutes to reach Union Station downtown (the train schedule says it should take 30). There I had to switch to the subway to go three stops to pick up the new Expo Line. But the switch was mismanaged by a Metro staffer who inexplicably packed two subway cars with people—while refusing to let anyone onto two relatively empty cars. That train left, stranding hundreds of us for another 10 minutes before another subway arrived and we were allowed to board. The switch to the new Expo Line at the Metro Center station for the third leg of my trip was smooth. But the Expo Line was painfully slow. Metro had advertised a 48-minute ride, but it took more than an hour. The track runs down the middle of streets—and the train stops for traffic lights at some intersections. In Santa Monica, after a six-block walk, I arrived at work two and a half hours after I had reached the Pasadena station—25 miles away. In that same time, I could have flown to Las Vegas, played the airport slots, and flown home, jackpot in hand. The return trip was even more frustrating. I waited another 20 minutes to board and depart on a train from the downtown Santa Monica station. Once on board, a fellow passenger started screaming how much Jesus loved me (even as I wondered if the transit gods had forsaken me). I opened my laptop, something I can’t do in my car, and got some work done with the aid of my office’s mobile hotspot. Yes, it’s BYO wifi. My attempt to conduct a phone interview failed (the train was too loud). And after about 45 minutes of typing with my computer on my legs while sitting on one of the train’s hard plastic chairs, my back started to hurt. As I boarded the Gold Line, I had been in transit for nearly two hours. I needed to go to the bathroom, but no such luck. Metro trains, not exactly designed with multi-hour voyages in mind, don’t have bathrooms. 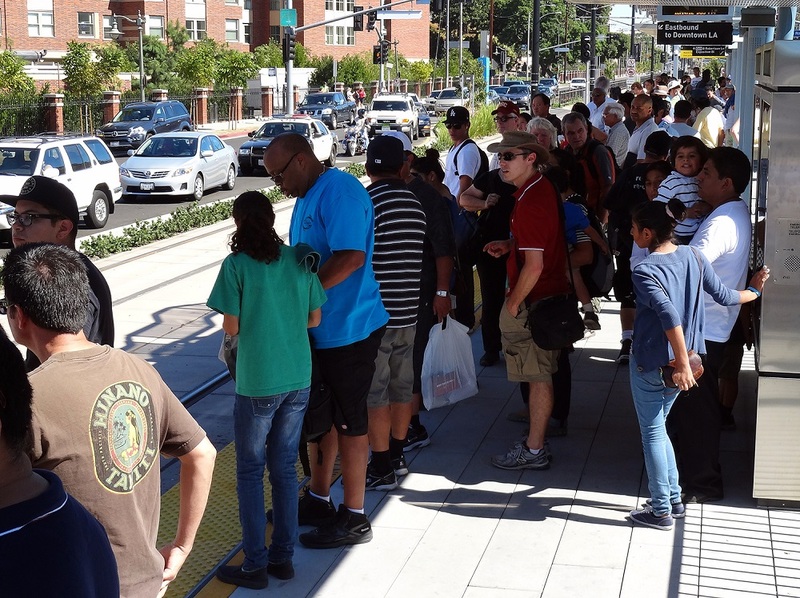 And I couldn’t work on the Gold Line—the two-car train was so full it had no open seats. I had allowed myself two and a half hours to return to Pasadena, grab my car and pick up the boys at preschool by 5:45 p.m. It wasn’t enough. Metro’s very affordable $1.75 fare—less than a buck an hour!—had become a $31.75 trip, with the $30 preschool fine for late pickup. I had spent nearly five hours commuting—and just four and a half hours at work. Yes, our car culture isn’t sustainable—but neither is public transit like this. 539p train arrive. total round trip commute today 4 hrs 50 mins. I was in office for 4 hours, 30 minutes. I can't afford to Go Metro. There were things I liked about the ride. I loved the walks on either end. The city looks beautiful from the various bridges along the new Expo route. And I liked the fact that I bumped into three people I know. But the ride was simply too slow, and the experience too rough, to be comfortable. I did the same commute two more days—and things were smoother and faster, but the round trip still took me four hours. And all that time on the train took a physical toll—I felt sore at night. I also felt frustrated—at California’s underwhelming ambition. Over and over in this state, from our famously frugal governor to our tax-phobic voters, we tend to choose the cheaper, easier path rather than the better, arguably necessary, one. For this vital east-west axis, Metro and local governments didn’t have to create a relatively cheap and slow light-rail line that stops at traffic lights. They could have built a proper subway-style line to whisk people efficiently over greater distances. That would have better served their cities, and attracted more riders (There were 12,000 Expo Line rides on the seven new stations my first day—as many people as board the New York subway every three minutes). But that would have cost a lot more money, and it would have been nearly impossible to get political support and funding. Complaining about such things is politically incorrect these days. Dogmatic transit cheerleaders responded to my disappointed first-ride tweets with taunts that I should live closer to work, which seems an odd rallying cry for people championing public transit investments, and a fairly elitist one too when you consider the cost of living anywhere near Santa Monica. I’m not giving up on rail altogether. As more train cars are added, waits for trains should shorten and riding should become a little more comfortable. But I’ll continue complaining until officials speed up the Expo Line—for starters, by adding technology that will change traffic lights so that trains don’t have to stop and by closing redundant stations (USC has three stations very close together). And, now that I’m experiencing the need for improvements firsthand, I’m very glad that Metro is planning a November ballot measure that would raise sales taxes to cover $120 billion in transportation projects, including all kinds of expansions and upgrades of train and bus lines. When I drove to work one day later last week, the commute was still miserable—two-and-a-half hours round-trip. But that was much faster than it had been on Metro. And my body felt fresher and I got to listen to the radio. Which is better—car or rail? Both are awful, just in different ways. I console myself in knowing that now at least I can pick my poison. Joe Mathews writes the Connecting California column for Zocalo Public Square. Primary Editor: Andrés Martinez. Secondary Editor: Sara Catania. *Photo courtesy of Craig Dietrich/Flickr.